This is "Sieb," Niles Raymond Siebert. Here is Jig in 1944. Jig named his 4th son after Niles Raymond Siebert. Here are a few excerpts from Jig's letter to Raymond about his namesake. If you have moment to read whole letter, you'll get a brief glimpse of two remarkable men who I doubt thought of themselves as remarkable. So here’s what I remember about “Sieb” -- Niles Raymond Siebert -- at least, in summary form. ...some of these German immigrants arrived in the Midwest via Canada. Among them were the Sieberts who settled in northern Kansas near what is now the town of Marion...Niles Raymond Siebert’s grandparents were among them and this was to be the village where “Sieb” grew up, a town, which he claimed, boasted a population of 36. “Sieb” played varsity football at Kansas and having finished under-graduate school enlisted in the Navy flight-training program about the same time I did -- just before the start of World War II. I remember seeing him a few times when we were in training in Pensacola and Miami, but I really didn’t know him well then. After the loss the YORKTOWN we were brought back to Hawaii and were re-organized into a unit designated as Scouting Squadron 6, ostensibly to go to the ENTERPRISE. Some replacement pilots brought over from San Diego joined us in Hawaii. “Sieb” was in that group. “Sieb” and I became roommates on the SARATOGA beginning what was to be perhaps my life’s closest friendship. “Sieb” and I were among those sent back to Norfolk to establish Bombing Squadron 15 for the new U.S.S. HORNET soon to go to sea. The ESSEX was to take took a very active part in the Central Pacific push, which ended in the Philippines. 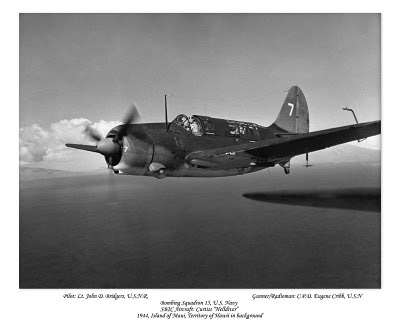 We started off by attacking Wake and Marcos Islands -- Marine bases that had been captured by the Japs in the very early days of the war -- carried out scattered raids around the area, and then took part in recapturing the Palau’s and the Marianas. Guam, which after its re-capture would become Nimitz’s headquarters for the Pacific Fleet, was in The Marianas. It was when we were attacking Guam that “Sieb” was shot down and crashed in flames. By then we had been roommates for about 3-1/2 years -- a time which, believe me, was stretched out in perception by the intensity of wartime life, and particularly when the specter of danger, both in operations and combat, is a constant facet. Even today it seems more like a decade. Sieb” was as close to a brother as I shall ever know and I grieved over his loss as much as I have for anyone in my life. “Sieb” and I became constant companions during a very intense time of life that when he was suddenly there no more it was as if part of me was missing. After that I always entered into “service” friendships with the reservation that the same might happen again and did not get too close. When Edie and I choose to name our fourth son after “Sieb,” we agreed that Raymond, his middle name, would be the better choice. Over the years I have come to think only of my son when I hear the name Raymond Siebert though every now I still think of the great guy our son was named after. Those memories make me feel good that our Raymond carries on his name. You won't regret reading the rest this Memorial Day. Thanks to Mac, Jig, and Sieb and all the others. Sieb's gunner, Leon Murray. Don't know if Leon was aboard Sieb's fatal flight. I asked Silas J. Durant how long it took him to paint this. He said he had to forget about time in order to get his paintings done. I should say so. The geometry, the realistic surfaces, the worn floor, the beautifully proportioned room with an uncanny corner - that would be enough. This is "Cycle of Time, 2009"
But Silas cut Andrew Wyeth's 1948 " Christina's World" in half, added Jan Vermeer's "The Lacemaker" 1669-1670 and threw in Jean-François Millet's "The Angelus" 1857–59 for good measure. 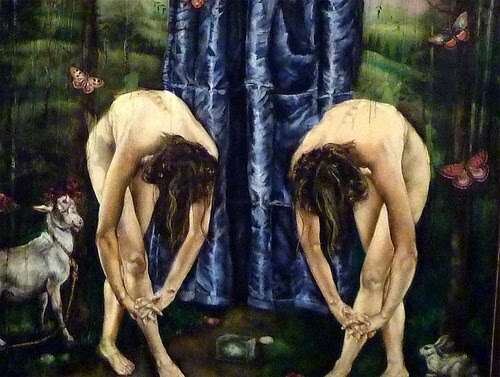 I guess this painting took at least 350 years, give or take. You probably know this about Christina's World "Wyeth was inspired to create the painting when through a window from within the house he saw her crawling across a field." On the right Silas Durant's room with manikin and Vermeer's "Young Woman with a Water Pitcher." "Life is Not, 2010 "
These are just two of Silas' amazing pieces. 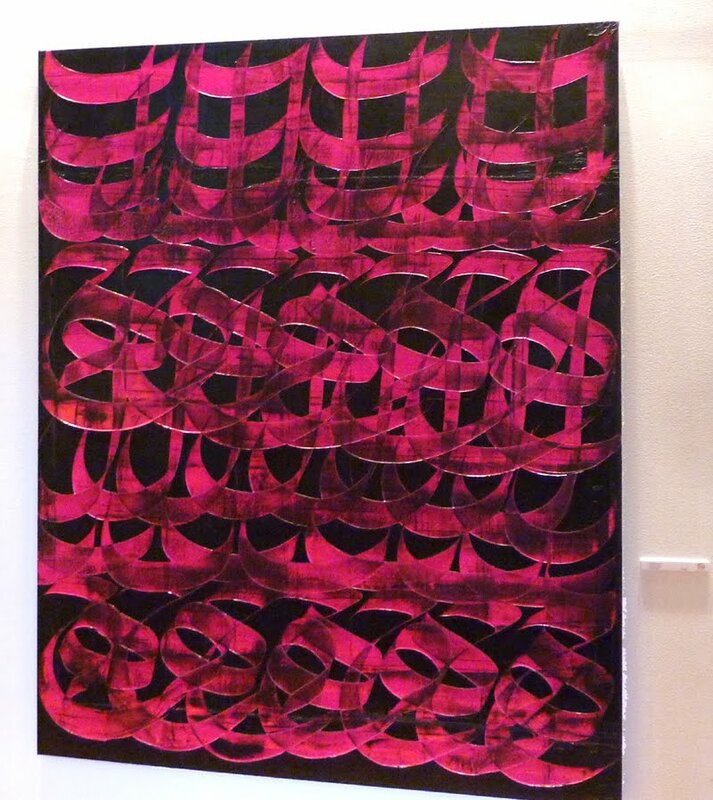 Silas J. Durant is showing at Mason Murer Fine Art in Atlanta. Get over and see them for yourself. I wasn't the only person who wanted to be at that table. Seaside sunlight shone from the painting into the gallery. I could almost feel the breeze making the curtains flutter. It's an Architecture Tourist 2-fer. These photos of photo realism are from Mason Murer Fine Art in Atlanta. At the reception last Friday I turned into a gallery of calm by husband wife artists James Neil Hollingsworth and Karen Hollingsworth. How about a PB&J from James? More realistic than the real thing and wittier too. I can't imagine a more appetizing or dramatic sandwich can you? I returned to the gallery at the end of the night, wishing I was there at the table. This is "Beachread 3" by Karen Hollingsworth. These paintings fill me with sentiment and nostalgia rather than angst. 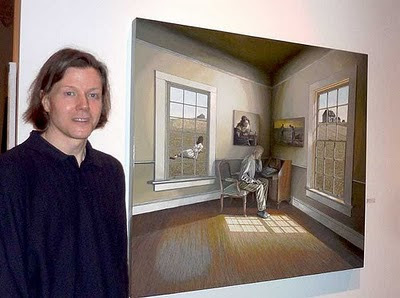 I imagine commissioning the Hollingsworth's to paint my favorite room looking out to my favorite view. I'd place the painting to provide a zen view at the end of a long hallway, or in a room without much of a view. Maybe I'd just keep it with me as I moved from room to room. 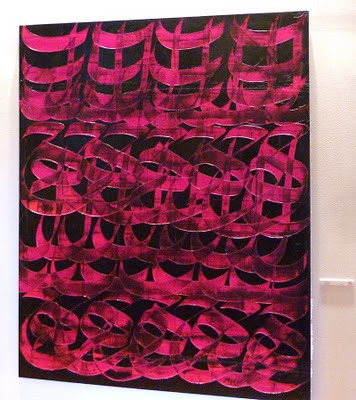 At Mason Murer Fine Art, paintings by C. Dawn Davis kept pulling me back. The colors are ocean deep; the subjects mysterious but witty. Above is just a detail. Here is the whole "There Is Still So Much We Don't Know About The Rites Of Spring" thing. Click it so see it bigger. To the left it Ms. Davis' "Playing Possum." Even from a distance amidst other extraordinary art, the blue and the symmetry of Rite of Spring (far left) caught my eye. More from Mason Murer later. The Congress for the New Urbanism (CNU) is conducting it's 18th conference in Atlanta this week. I attended a day of free events put on by NextGen, the next generation of New Urbanists. 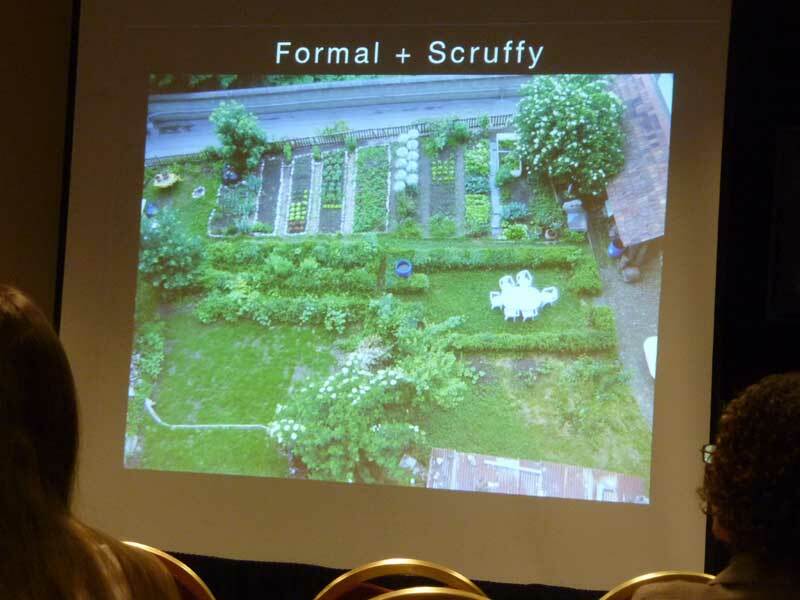 When landscape architect / new urbanist Benjamin Morton showed this slide, he probably didn't know he'd nailed me. I'm formal + scruffy except I'm not formal. This is the actual view from a European parliament building. It overlooks a kitchen garden. Here is Ben Morton, landscape Architect at Carol R. Johnson Associates. He believes that landscape architecture should play a bigger role in new urbanism. The street plans write checks that the plants can't cash (see "Top Gun" script). He said some startling things about trees planted between sidewalks and streets. He reminded me that oaks that are a trademark of my neighborhood crack our sidewalks and streets, crush our houses, and sometimes kill our neighbors. Some Morningside streets require much more landscape maintenance than others. I would shame Johnson Road. But my street is a bit less formal, easier and cheaper to maintain, and charmingly scruffy. Chez Kearns with a lawn of clover, wild strawberry, moss, and mondo. "Many gardens are formal and artificial. The flower beds are trimmed like table cloths or painted designs. The lawns are clipped like perfect plastic fur. These gardens have none of the quality which brings a garden to life... "
"A garden growing wild is healthier, more capable of stable growth, than the more clipped and artificial garden. The garden can be left alone, it will not go to ruin in one or two seasons." Anyway, I'm heeding Ben Morton's call to scruffy. 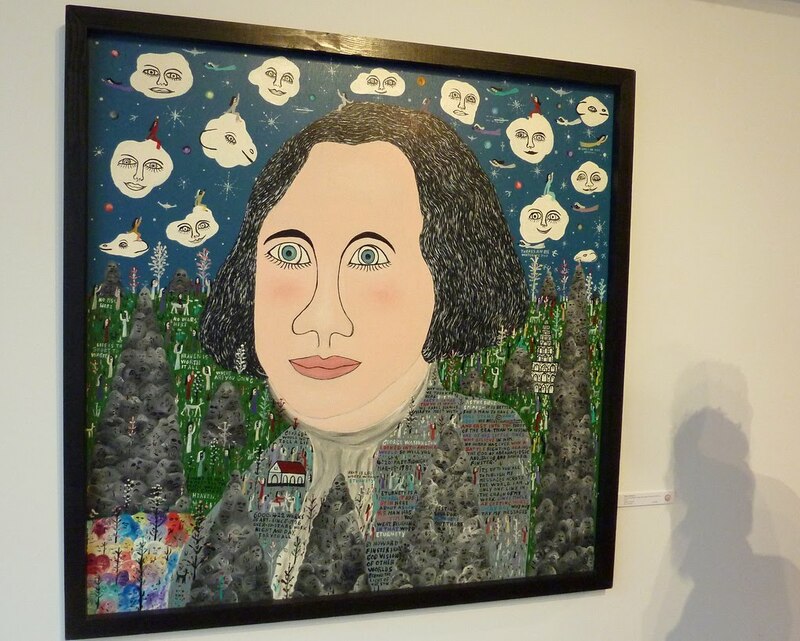 Mark Mason Karelson from Mason Murer Fine Art curated the latest exhibition at Peters Street Gallery. We were fortunate to visit during the May Castleberry Hill Art Stroll. "Choices" by Alvaro Alvillar. I think "choices" refers to the different ways these paintings can be arranged for exhibit. Here we have 2 rows rounding a corner. Each flag is different. The closer you get, the more there is to see. By local graffiti and fine artist Sam Parker. I don't know the artist but the display draws me closer. Peters Street Gallery is a working frame shop but that's an understatement. The back porch, a former loading dock, is a wonderful place to hang and chat. And a great place for a giant sculpture of a bull. Details from Howard Finster's "Visions of George Washington." Mark Mason Karelson, director of Mason Murer Fine Art on the left at the May Castleberry Hill Art Stroll. Artist Trifecta Gallery is a relatively new addition to the Castleberry Hill neighborhood of Atlanta. On the left is gallery proprietor Amanda Brown. 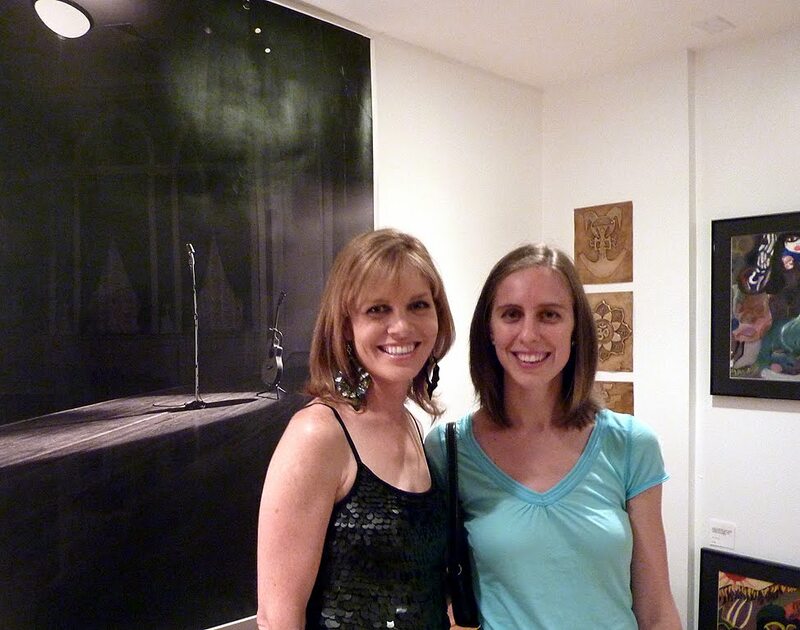 In the background: work by Nigel Marson, which became a cover for Edwin McCain's Austin Series CD. Artist Trifecta lives is this extraordinary building. 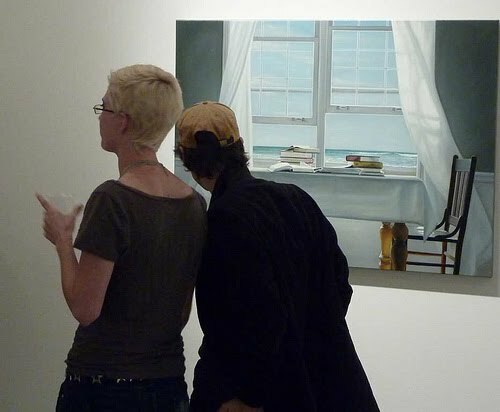 Several of of Atlanta's great galleries are neighbors. A variety of art and photography - some quite affordable - fills the multilevel space. There was a lot to see. This was my favorite:. Tinybopper look with the retro chair? There was a good crowd at Artist Trifecta for the May Castleberry Stroll. You can see Atlanta painter, cartoonist, musician Tom Ferguson as a blur (he's fast). Tom came to Atlanta originally to restore the Atlanta Cyclorama. We've met Amanda before. She is THE Amanda Brown of Body Part Art. Here she is demonstrating lifecast sculpture at ZuCot Gallery last November. Best wishes to Amanda and Artist Trifecta. Check it out the next Castelberry Art Stroll on June 11, 2010. Three architecture tourists did the Castleberry Hill Stroll on Friday. We met some nice folks. Here is some huge calligraphy at Peters Street Gallery to get us started. I'll get back to the art in another post. On the left is Mark Mason Karelson of Mason Murer Gallery. He curated the current exhibition at Peters Street. Very fine work I think. Next door is Artist Trifecta owned and curated by Amanda Brown on the left with AT Katherine. In the background: work by Nigel Marson, a cover for Edwin McCain's Austin Series CD. We ran into 3 other online notables at the Granite Room: from right to left: Ciambellina, HamWithCam, Inside the Perimeter, and me (Architecture Tourist). We're all a little shiny from the waw'm Atlanta evening. Ciambellina is Jeanne Bonner who blogs in Italian and English!! Jeanne is also a writer/voice on WABE and blogger on Atlanta Unsheltered. If she sees my daughter, she seeks me out to say hello - thanks Jeanne. HamWithCam is my old friend John from Decatur. John does is blogging with pictures on Flickr. He's a stalwart supporter of the Atlanta Photography Exhibit which hosted the Granite Room show for local photographers. I hadn't seen John in nearly 20 years which is my loss. Plus, John has the coolest shirt. Paul Nuesslein is the blogger Inside the Perimeter. He's a photographer and software guy who first ITP post was in October 12, 2004. I'm looking forward to meeting Paul again. I'm Terry your host. I'm honor to be in the picture. Cooks? You've heard about the Atlanta Street food Coalition? They are about to get you and that's a good thing. Here is Hector Santiago cooking in a tent behind Peters Street Gallery. Hector is one of the 3 Atlanta Top Chefs from last year and owner of Pure Vida. Nice guy. This is the Good Food Truck. Yummy. The whole truck looked good enough to eat. I've got to go now. It's my birthday. I got some cool pictures. "Your Head is Full of Stars" Improv Dance and Music left me with great memories. I went on a lark with GloATL fresh on my mind. Why not try more improv dance? Allen Welty-Green is keyboardist for Zentropy featuring Gabriel Monticello - bass and Davis Petterson, drums. They supplied the music. Crossover Movement Arts, (Blake Dalton, artistic director) provided the dancers. 3 sets of music, 3 sets of dancing, an hour and a half of unexpected delight. The music and dance would have been fine by themselves. Musicians and dancers played close attention to each, rare for rock/jazz music genre. It made me feel more involved. Allen is wearing the hat. There was a red dance. This is local renaissance man Thomas Bell, co-founder of the Decatur Book Festival and the festival's program director. Dances a bit too. One of the great things about Eyedrum is that I don't feel tied down to a seat. I moved around to get different views. I guess that's crowd dancing. The body curves mesmerized at times. I never quite knew was was next or even if they would stay on the wraparound stage. Here is Allen Welty-Green (hat) after the show. Another renaisance man, Allen is the leader of Eyedrum which founded, funded, designed, constructed, staffed, cleaned, and managed by Atlanta artists. It's an Atlanta treasure, located 2 blocks west of Oakland Cemetery. It's a bit on the edgy side. I got a tiny bit of video of some funky sashaying during the white dance. This one is on it's side (dunderhead!!) with a bit more "space" in the music. 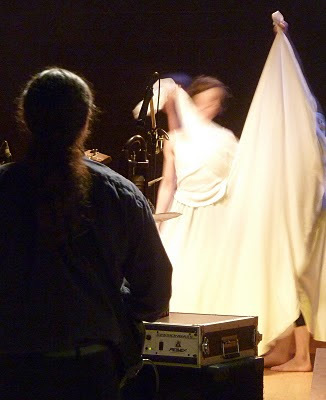 So thanks to Eyedrum, Zentropy and Crossover Movement Arts for a great night, March 13, 2010.